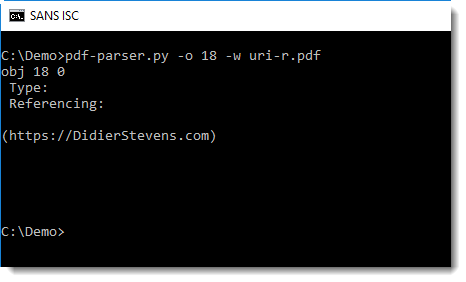 I've written before about PDFs with URLs used in social engineering attacks (TL;DR: nowadays, it's more likely you'll receive a malicious PDF that just contains a malicious URL, than a PDF with malicious code). Since then, I've had a couple of questions about such PDFs where the URL is stored indirectly. Let me give you an example. 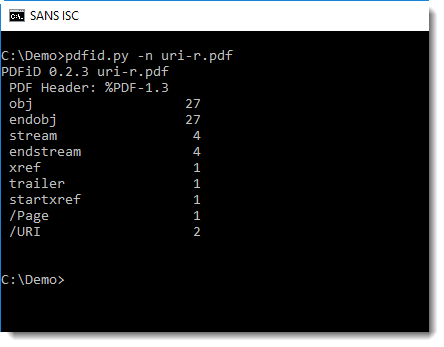 You can see that name /URI appears twice: this is a strong indication that the PDF contains a URL. Instead of extracting the URL, we see that value "18 0 R" was extracted. 18 0 R is a reference to an object with id 18 and version 0. 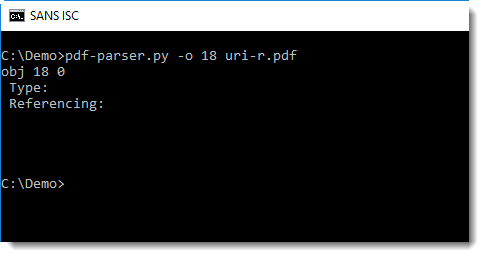 Now we can see that object 18 is just a string: the URL we wanted to extract.